The LKS organizes at least one excursion each year to a large scale facility. 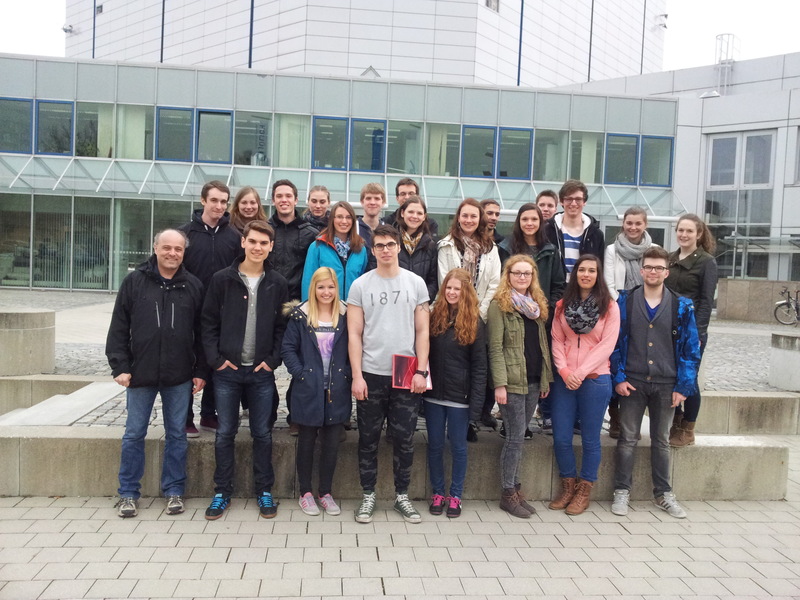 On 26th of March 2015 we visited the Research Neutron Source Heinz Maier-Leibnitz (FRM II) with students of the 3rd semester of the Integrated Live Sciences Program at FAU (cf. top picture). We started from LKS by bus at 11:30 and arrived at TUM in Garching 13:30. After a short passport control we were welcomed by Claudia Niiranen, who perfectly organized our whole stay at FRM II. Then we started our visiting tour through the research areas of the FRM II in four groups. We could have a close look to the many different large scale instruments designed for studying the structure and dynamics of matter. Many applications in different scientific areas ranging from medicine, biology, and pharmacy to materials science, solid state physics, and applied sciences could be introduced shortly demonstrating the importance of neutron scattering in all these different fields. In the same context the students could get an impression on the fascinating work of a researcher at such a large scale facility. After the visit it is a traditional great pleasure for our student groups to be welcomed by the scientific director of the FRM II, Prof. Dr. Winfried Petry, who takes the time to give a lively introduction into the research with neutrons at FRM II. We had dinner with Leberkäs’, potato salad, and beer in the Campus-Cneipe close by the FRM II before we returned by bus in Erlangen at 10 pm. As always, the excursion to FRM II was extremely informative, perfectly organized by the staff in Garching, and an unforgettable event. We would like to thank all the people at FRM II who made this event possible.